How to Simplify Workflow with Docsvault? Home/Blog/How to Simplify Workflow with Docsvault? Do you still use the traditional method of assigning tasks via email or chat? Though one of the oldest and most conventional method of collaboration, this is a faulty method with lots of drawbacks. Some of them are difficulty in keeping track of workflow, emails often lost amongst the bulk of other communication, failure to comply with regulations, etc. Docsvault allows assigning tasks to users in a systematic method so you can keep a track of all activities pertaining to a task. You can assign tasks, attach associated documents for reference, set priorities and reminders and do much more in Docsvault that help you to simplify workflow. Instead of browsing your emails and chat history to find particulars of tasks and check its due date, simply check Docsvault’s Task In panel and view all the tasks assigned to you in a neatly organized way. You can sort tasks according to users, start date or deadline, so that you know which task is to be done in priority. 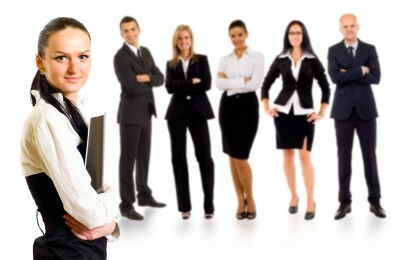 All the tasks that you have assigned to other users can be viewed within Task Out. 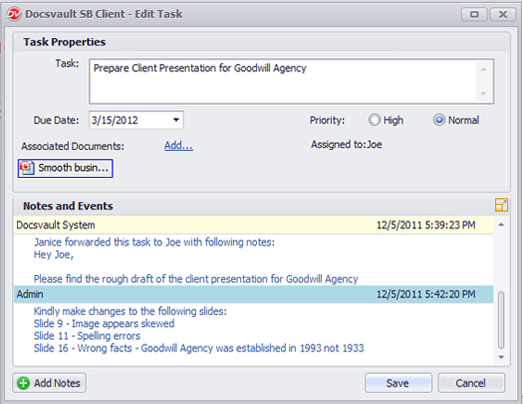 Here you can easily see the start and due date of each task as well as names of users to whom tasks are assigned. You can even follow up with your colleagues to find out the status of the task before the due date and ensure timely completion of the task. 1) Always give clear yet precise idea of the task in task description. ‘Prepare client presentation’ is a poor way of assigning a task. A good way to assign a task is – Prepare branding presentation for Goodwill Tyres. Refer KMG presentation for format. Consult Joe from design dept. for details. 2) Always make it a point to add notes and events after scheduled periods. These events can be about the status of the task, various events such as task started, task in progress, task forwarded, task approved, etc. This custom must be practiced religiously to ensure everyone knows what’s happening with the task. 3) All users must be encouraged to comment and add notes during and after the completion of task. This way you can get input and feedback from various users and make necessary changes immediately. This is an excellent way to collaborate and get inputs from users without spending your valuable time on meetings. Docsvault offers necessary tools to collaborate as well as communicate effortlessly. The only trick is how you make the best use of it.